Ludwig Mies Van Der Rohe, born in Aachen, Kingdom of Prussia (Germany) was a German-American modern architect in the post-World War I era. Ludwig, similar to many of his post-World War I contemporaries, wanted to establish a new architectural style that could represent modern times just as how Gothic and Classical did in their own eras. Ludwig worked for his father in a stone-carving shop and multiple design firms locally before he moved to Berlin. Once in Berlin Ludwig joined the office of interior designer Bruno Paul, and began his architectural career working as an apprentice at the studio of Peter Behrens from 1908-1912. Working as an apprentice he was exposed to Current design theories and also progressive German culture. His raw skill was soon recognized and then he began independent commissions even though he had no college education. He began his independent career by designing homes for the upper class. His style was influenced by 19th century Germanic domestic styles (cubic households). He rejected the eclectic and cluttered classical styles so common at the turn of the twentieth century as irrelevant to the modern times. He joined the German avant-garde (Avant-garde represents a pushing of the boundaries of what is accepted as the norm or the status quo), working with the design magazine G that started in July 1923. He developed fame as architectural director of the Werkbund, organizing the influential Weissenhof Estate prototype modernist housing exhibition. He also founded the architectural association Der Ring. He joined the avant-garde Bauhaus design school as their director of architecture. Ludwig became a citizen in 1944 completing his severance Germany. His thirty years as an American architect reflect a more structural, pure approach toward achieving his goal of a new architecture for the twentieth century. His efforts were focused on enclosing open and adaptable spaces with clearly arranged structural frameworks. Some of His early work at IIT both caught and opened Americans eyes to a progression on the late nineteenth century Chicago School style. Ludwig Mies Van Der Rohe is also successful in designing furniture such as the Barcelona chair, arguably his greatest success in furniture. He has also designed the Brno chair and the Tugendhat chair, all of which are different and spectacular in their own ways. Ludwig had played an important role as an educator, believing in the notion that his architectural skill and language could be taught and comprehended, then applied to design any type of modern building. He created a new education at the department of architecture of the Illinois Institute of Technology in Chicago. Mies's grandson Dirk Lohan and two partners led the firm after his death. Dirk, who had collaborated with Mies on the New National Gallery, preceded with existing projects however, soon led the firm on his own independent path. Throughout the last twenty years of his life, Ludwig developed and built his own vision of a monumental "skin and bones" architecture that reflected his goal to provide the individual a place to fulfill himself in present day. Mies sought to create free and open spaces, enclosed within a structural order with minimal presence. Mies van der Rohe died on August 17, 1969. 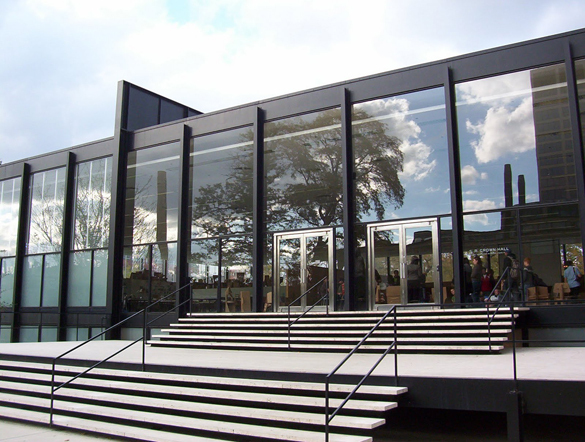 The Crown Hall, which sits in Chicago, Illinois, is one of the key figures of the simplicity of the modern art style, keeping the material count low while capturing the clean smooth edges.